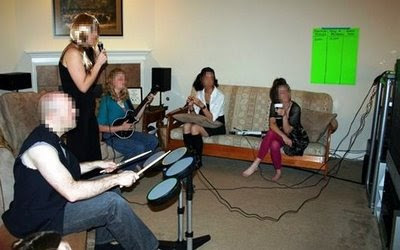 Recently our Bible study had a social night, and someone came up with the wonderful idea of doing a Rock Band party, complete with costumes and music trivia. 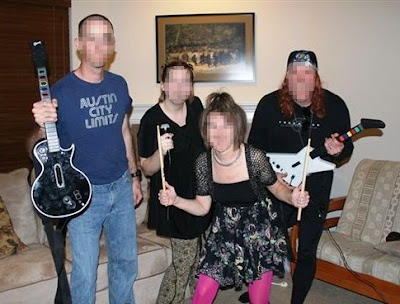 I'm not a huge player of the Guitar Hero genre, but one of my favorite things to do is dress up, whether it's a night out on the town or Halloween. The girl who planned the whole thing went all out, putting together supplimental games like "guess that tune" and "make your own rap song." Hehe, I wonder what we should play next time that would be equally engaging to a group of non-video game players. 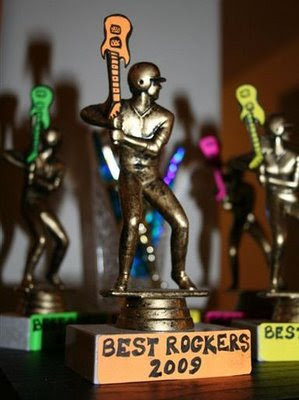 Each of us were assigned to a "band"
Rocker trophies for the winning team!